MaxDist = "X and Y ranges must be the same length"
MaxDist = "Must be at least 2 pairs of coordinates!" Enter the function as a normal function. This function and a variety of other coordinate geometry related functions are included on the spreadsheet IP2.xls, with full open source code. More details of IP2 here. 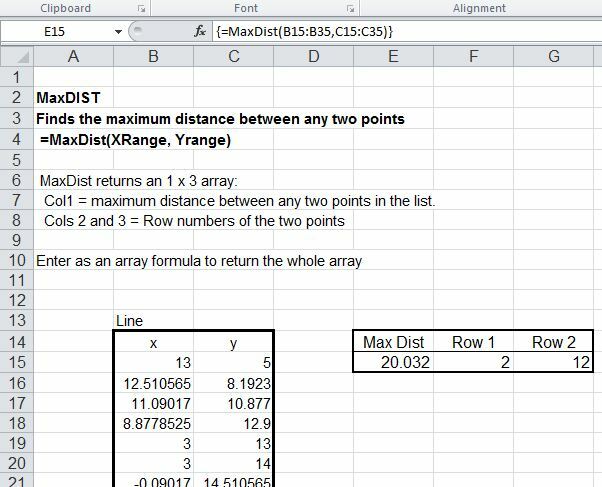 This entry was posted in Coordinate Geometry, Excel, Maths, Newton, UDFs, VBA and tagged Coordinate Geometry, Excel, MaxDist, UDF, VBA. Bookmark the permalink.